Protects — Seals defects from unwanted entry. Prevents — Helps stop outages. Durable — Withstands environmental extremes. Sunlight (UV) resistant. Versatile — Repairs various sizes and shapes of damage. Easy to Use — Kit contains materials to complete repair in a single visit. Polywater® Pad N Pole™ fixes and restores damaged utility enclosures to prevent humans, water, pests, or debris from entering through the affected area. Great for repairing lawn equipment damage. 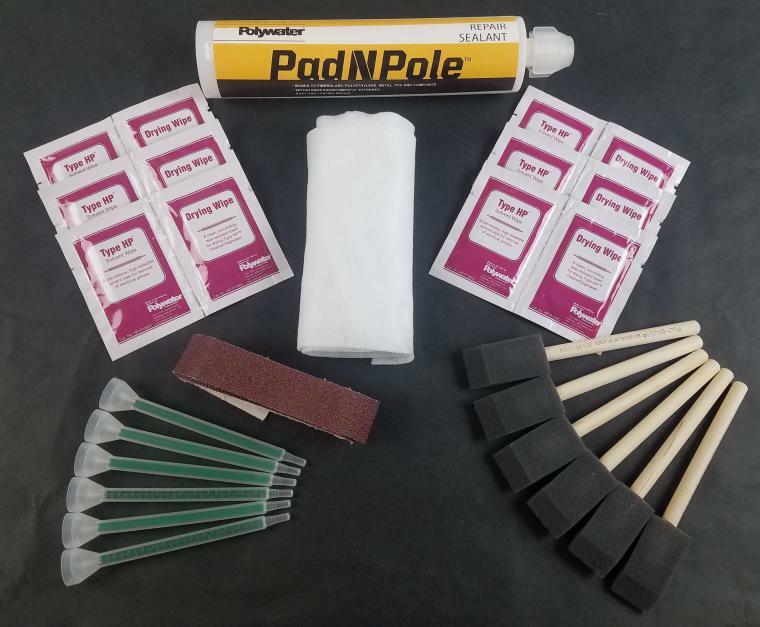 Polywater Pad N Pole two-part adhesive bonds to fiberglass, steel, polyethylene, metal, concrete, and composites. The resin repair system provides a durable, long-lasting repair. Polywater Pad N Pole adhesive is easy to dispense with a standard high-ratio caulking gun, and quickly wets the repair cloth. The fabric can be layered as necessary to create a thicker and stronger structure. Repairs are quick and easy, and can be done in the field in a single visit with little or no training. Repairs made with Pad N Pole withstand exposure to extreme outdoor temperatures, from -60°F to 200°F (-50°C to 90°C). A wide variety of defects can be repaired, from small cracks to holes. The Pad N Pole mixed resin has 30 minutes of working time. It can be painted immediately after application, so no return visit is needed.